Italy goalkeeper Gianluigi Buffon will play his final game for Juventus on Saturday after 17 years with the club. The World Cup winner, 40, will lift his ninth Serie A title against Hellas Verona at the Allianz Stadium. Buffon said he changed his mind about retiring 15 days ago and has received job offers on and off the pitch. "Next week, after two or three days of reflection and serenity, I will take my decision," he said. Buffon is facing a Uefa ban for comments made about English referee Michael Oliver, who sent him off during the Champions League quarter-final defeat by Real Madrid last month. Speaking at a news conference on Thursday, he said he was "sorry for offending the referee". "If I saw the referee again, I would give him a hug and say that he should have taken more time with that decision," said Buffon. "With the feelings, emotions and disappointment of the situation, I behaved in a way that was not usual for me. After that match, I went beyond the limits with the things I said about the referee and I apologise for that." Buffon, who joined Juventus from Parma in 2001, has ruled out joining another Italian club, saying he does not want to play in a "minor league" and could take a six-month sabbatical. He said: "Fifteen days ago, I was already an ex-player. Now I'm not sure any more. Proposals have arrived for some new challenges on and off the pitch. The most important off the pitch is from Juventus." 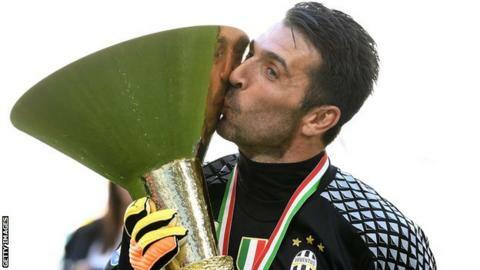 Buffon has captained Juventus to a seventh straight Serie A title and fourth consecutive Coppa Italia triumph this season. "Saturday will be my final match for Juventus and to end this journey with two cups and with the president and the entire Bianconeri world by my side, will be very special," added the Italian. Wojciech Szczesny, who moved to Turin from Arsenal in 2017, will succeed Buffon in goal next season. Buffon, Italy's most capped player with 176 appearances, retired from national team duty after they failed to qualify for the World Cup in November. He said he will not play on 4 June in a friendly against the Netherlands, adding he will "stay away from the national team". Buffon started his career at Parma, making his Serie A debut on 19 November 1995, aged 17, in a 0-0 draw against Milan. He helped the club win the Uefa Cup and Coppa Italia in 1999, before sealing a move to Juventus in a £23.3m deal in 2001 - at the time a world record for a goalkeeper. In his first two seasons at the club, he won two consecutive league titles and two more followed in 2005 and 2006, but they were later stripped due to a match fixing scandal and the club were relegated to Serie B.
Buffon endeared himself to the fans by staying with the club, winning promotion back to Serie A in 2007. He became club captain following the departure of Alessandro Del Piero in 2012 as Juventus won the first of seven consecutive Serie A titles. Buffon has never managed to win the Champions League, losing the 2003 final to AC Milan, in 2014 to Barcelona and in 2017 to Real Madrid. From Parma to Juventus to where? What next for 'Maradona of goalkeepers'? Read more on Gianluigi Buffon: 'Maradona of goalkeepers' bids farewell to Juventus, but what next?